The Seto Sea is Japan’s inland sea and it is dotted with small islands. 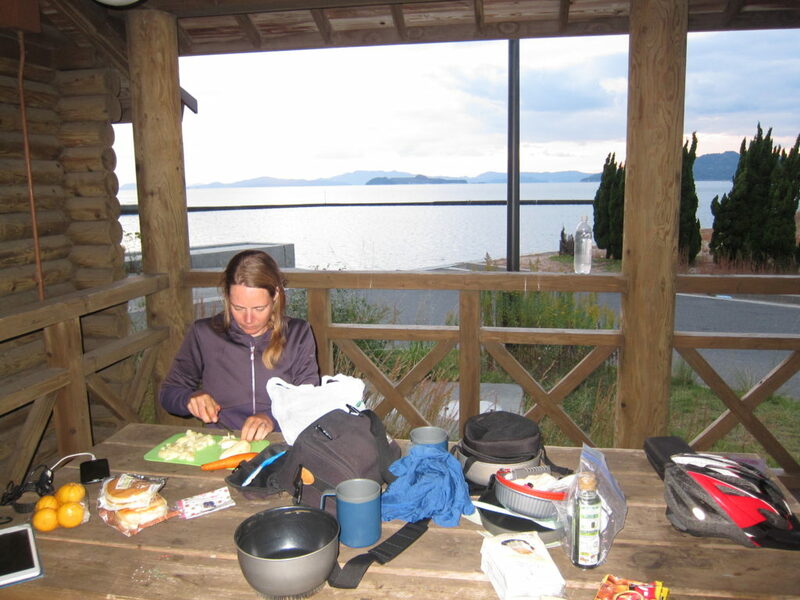 Over the next three days we will cycle from island to island, connected via elaborate bridges or sometimes a ferry. We start in Etajima, just south of Hiroshima. There are several cycling routes but the one we had our eyes on is, of course, closed, so we’re taking the one that goes straight over the hills in the middle of the island. It’s not a very big hill, just steep. And because we are much more Southern now the weather has changed. It’s hot! We’re back to short sleeves. I am not complaining though, because it is beautiful to ride along the shore (once we make it over the hill), sun shining in our faces in the morning and down our backs in the afternoon. It reminds me of the Mediterranean, except that the rocks and soil and shapes of the land are very different. But they do grow oranges here, and mandarins, and figs! We even pass bushes of wild rosemary and suddenly it’s like we’re on holiday in Spain. Late afternoon on our first day on the islands we find the nearly perfect campsite: a log building which is basically a giant picnic area with roof and tables, and toilets in the back. The toilets haven’t been cleaned in a while and there is no paper, but we’ve dealt with worse than that. There is running water and even a plug so we can charge our devices. And best of all: there is an onsen just 500m down the road (up the hill) so after cooking our curry we wash off all the sweat and everything is pretty much perfect. This seaside cycling makes me miss the years I lived on the beach, in Malaysia, Indonesia and Oman. The sea was always just there and it was both my office and my home. Now it is here again, a different one of course, swirling with currents in the narrow channels between the islands. “I wonder what secrets you hold”, I think out loud. What is beneath the surface here? The next morning we wake up and walk around the tide pools to see what we can find. We find a jellyfish, a nudibranch (yay! ), a small scorpion-fish type fishie and a whole lot of plastic and Styrofoam rubbish. We have gotten up early so we can do the 30km to the port and catch the ferry to Imabari. To get there we need to cross several small islands, each of them we circle around the coast until we hit the bridge to the next island. It is easy riding, apart from climbing up the bridges. 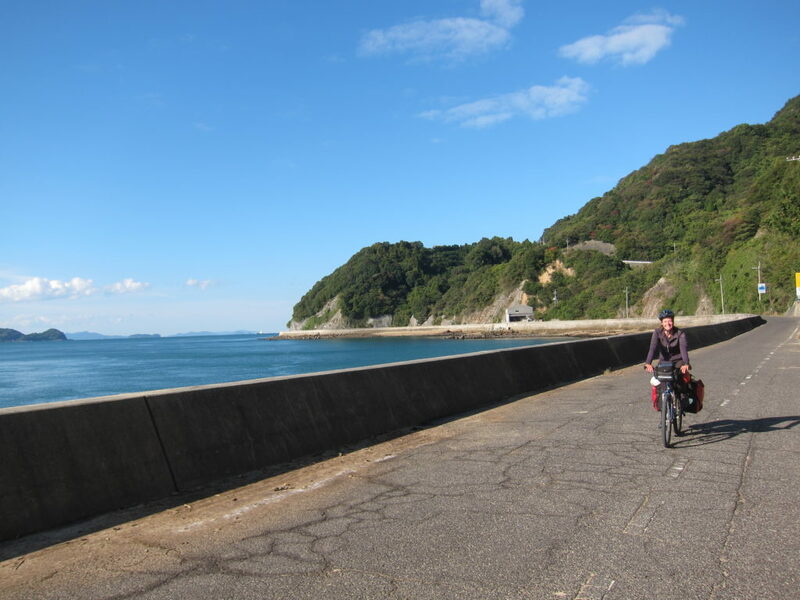 We have received conflicted information about the ferry schedule: a random internetforum says one thing, the poster in the onsen yesterday another, and the cyclists we met yesterday yet another. So we gamble. We arrive at the port earlier than expected, at 09:40, and find out that the ferry that would take us and our bikes has just left at 09:36. The next ferry leaves at 12:30 so suddenly we have a few hours in our day for waiting, reading, getting sunburned. At 11:00 the local café opens and we chat with the owner, who is an interesting man. He excitedly shows us his butterfly collection, his records (he is a musician), and pictures of the 1000kg weighing ‘mobile’ pizzaoven he built and that is featured in a DIY magazine. We stay so long that eventually the ferry operator comes to pick us up from the café, motioning that we really have to go now. Almost missed the boat again! 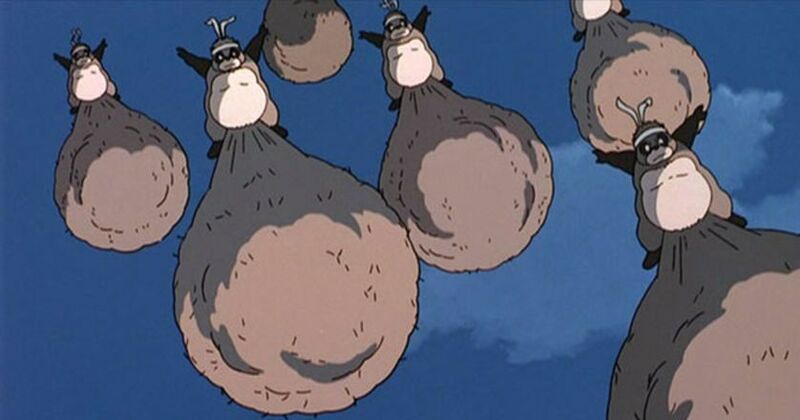 According to the film, and according to legend, they have very big balls (as you can see), but it was too dark for me to confirm or deny that. The next day it is rinse & repeat until we set foot back on the mainland, in Onomichi, mid morning. Onomichi is a coastal town which is not terribly exciting, except that today, November 3rd, there is a religious festival where some people dressed up as demons lead a procession an beat children with sticks. Sounds fun, so we stick around to watch. I have never seen so many terrified children in my life. After the procession has passed I am eager to get going and catch the shinkansen back to Osaka, but Antonio has other plans. First we queue for 45 minutes for kitsune (fox) ramen, which are delicious and since we need to eat anyway, fine. After that he wants to climb up the hill to the old town (stairs! my legs!) to visit some temples. Temples? We have seen them everywhere! “What is so special about those, except that they’re on a freaking hill? !” I complain. “Stop whining and just come with me”, he says. Hmpf. When we turn around a corner there’s a cat sitting on a bench, totally relaxed. Another one curled up on a low wall, also totally chill. “Let me just sit here and pet this kitty”, I say. Antonio is like, sure, and he grins. “What? 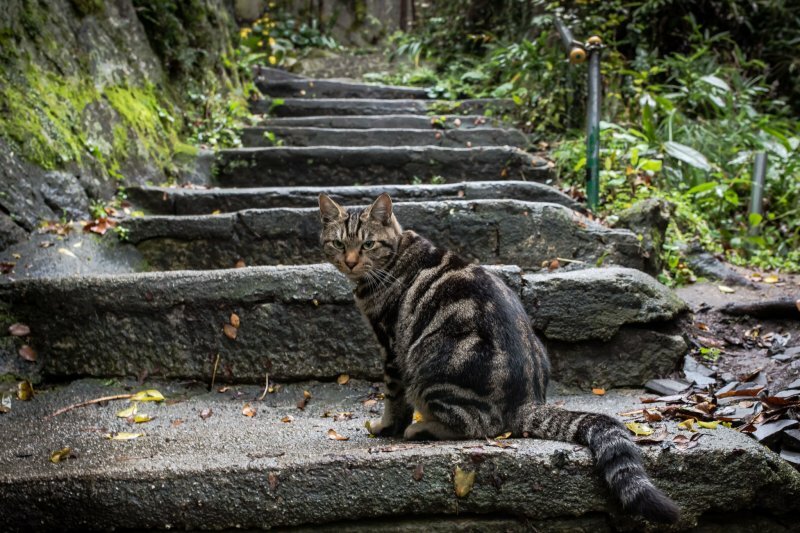 !” I’m still annoyed by these stupid temples and these stupid stairs and his stupid grin but at least there’s a cat now. “Okay let’s go”, he says a minute later. I sigh and get up, giving the pet a last scratch behind the ears. Then a quick cuddle for the one on the wall. More stairs. And then suddenly we turn around another corner and there is a huge open area and there are cats everywhere and people playing with them and petting them and trying to lure them with kibble and just SO. MANY. CATS. It’s like an open-air cat café. “OMG You’re the best thank you for not listening to my complaints and luring me here under false pretenses so we can PET ALL OF THE CATS” I shout as I hug him.